As a marketer, you want to provide the most usable – and most reusable – content possible, saving your team time as you increase the value your audience gets from your assets. But how do you do that? Here’s one way: Chunk it. In other words, create your content in chunks – think of them as components or modules – according to the types of information you want to convey. “Chunk” is an abstract word by necessity. A chunk is simply a discrete unit of content. It may be as small as a bullet point or as big as a book. It may be a paragraph, a section, a chart, a table, or an entire deliverable. An infographic, for example, is a content chunk itself even as it may be part of a bigger chunk (a blog post, say) and even as it contains chunks (like tweetable graphics) that you could lift out and reuse out of context. This article was inspired by a talk given by content strategist Noz Urbina at the Intelligent Content Conference: How to Create Topical and Evergreen Content From the Same Content Assets. If you don’t think about information types, you’re likely to mix them up or smoosh them together – the opposite of chunking. As a result, your audiences may find your content difficult to use and your content teams may find it difficult to reuse. Here, with slight modification, is an example from Noz. He picked an esoteric example on purpose. You don’t have to read it to see that the revised version is more usable. In the original version, you must read the text, possibly multiple times, to figure out it includes both a description and a method. In the revised version, even if you don’t read the text, you can tell you’re looking at distinct information types. Reuse potential: With the information types separated, not only do readers have an easier time, but content creators also have more opportunities for reuse. Imagine, for example, that your repository contains lots of reports like this. You could mix and match those chunks to create new content deliverables. For example, you could pull the descriptions into a catalog and leave out the method sections. That kind of reuse, whether manual or automated, becomes possible only when your teams keep information types separate. Let’s move to a couple of examples from CMI – an e-book and a pair of blog posts. Keep in mind that you can chunk any kind of deliverable – infographics, webinars, and more. Reuse potential: While these four chunks are arranged from left to right to create a spread in the playbook, they could be reused on their own or mixed and matched any number of ways to form new deliverables. Last year, as I was writing up Ardath Albee’s ICC 2016 talk for what I thought would become a single blog post, I noticed that she covered two types of information: descriptive and how-to. 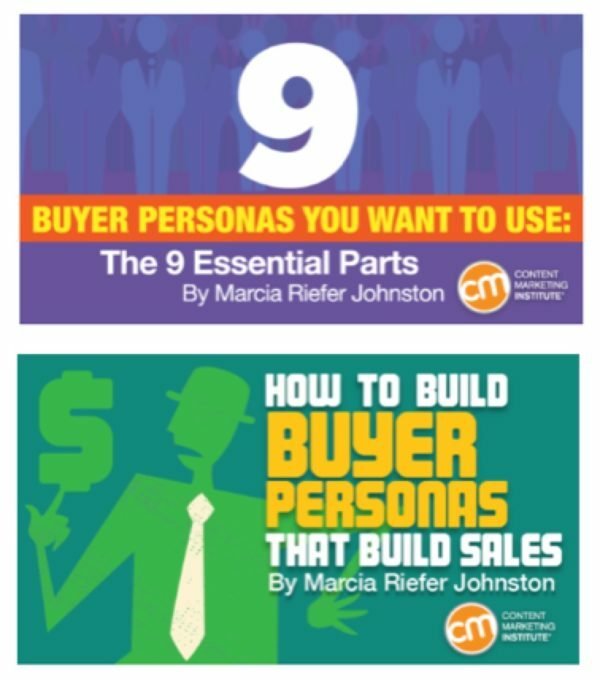 Since Ardath had a lot to say, I created separate posts for each information type – Buyer Personas You Want to Use: The 9 Essential Parts and How to Build Buyer Personas That Build Sales. These two posts work separately or as a set. The titles indicate the overall type of information. Within each post are more chunks. For example, the first post starts with a definition of the term “persona” and moves on to recommend nine best practices. 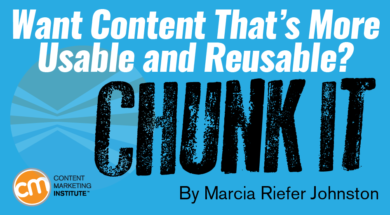 Reuse potential: Chunked content is potentially reusable content. For example, if you had a bunch of definitions of “persona” sprinkled throughout your content repository, you could compile them in a list. Noz suggests chunking your content in terms of the Precision Content® information types: concept, task, reference, process, principle, narrative, and ornamental. The main thing to notice about these is that each answers a unique type of question. 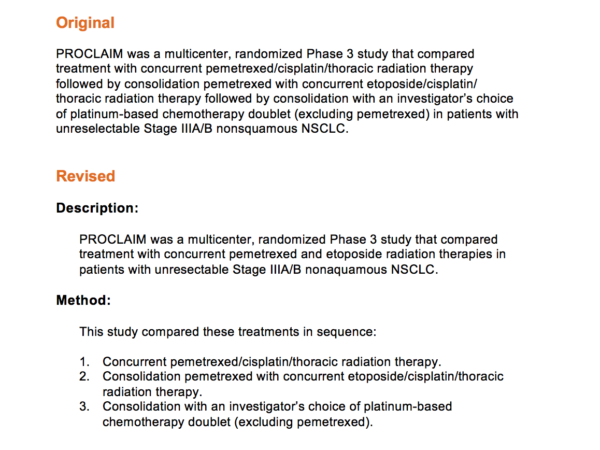 Bonus question: What information type is this table itself? The first one to enter the correct answer in a comment wins bragging rights. This information-typing framework was developed by Noz’s partners at Precision Content based on a long tradition of chunking best practices for post-sales and policy information. Noz has been working with Rob Hanna at Precision Content to extend the types to cover the needs of marketing content as well. Other information-typing frameworks exist, for example, DITA (Darwin Information Typing Architecture), which includes five standardized topic types: concept, task, reference, glossary entry, and troubleshooting. Even if you don’t want to use the names or types recommended in the table above, this framework and others like it can get you thinking about a framework that would work for your team. You may say that this is documentation, not content marketing. And yes, this page is on help.getpocket.com. 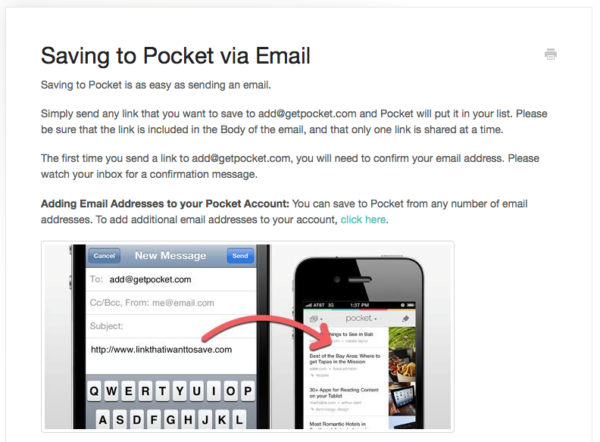 But consider that this is the seventh most-saved article in Pocket’s trending tech articles. It has been saved 20,000 times – more than stuff by Feedly, Life Hacker, Vox, and Search Engine Land – because it’s good, value-added content that helps users accomplish an objective. It gets brand awareness. People are engaged with it. They will share it. Our research shows that the lowest percentage of marketers are focused on loyalty and retention. If we would focus more on that, we’d have less heartache … Focus first on customers that already know you and have already purchased from you. Determine your most commonly used information types and consistently chunk your content according to those types. Consider adding more how-to information to your mix. 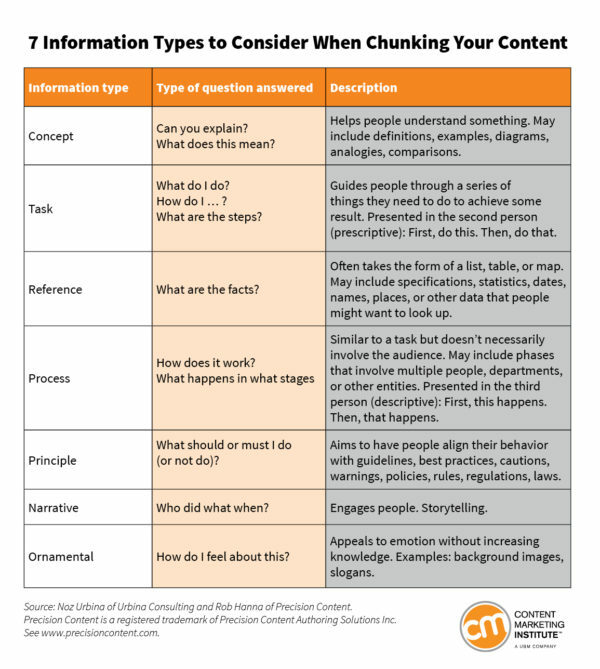 What information types does your content team plan for? How much of your content helps people with tasks? Let us know in a comment.